Earlier this year, when she spoke at a conference for public sector people in Edinburgh, our former Head of Digital Sally Meecham described “digital” as “a way of thinking and behaving”. When I think about that it logically leads me to a simple conclusion: if you're talking about changing how people in an organisation think and behave, you're probably mean culture change. And that's hard to do. Hard, but not impossible, and not complicated. Mainly just hard and probably slow, because organisational culture builds up over many years. It becomes something that's ingrained in the minds of people who’ve been here for years, and learned by newcomers within their first few weeks. Changes to those cultural norms need to be done sensitively - we need to introduce new ideas without stamping on the valuable old ones. We're building Communities of Practice - an essential tool that helps people working across all the different parts of Defra to get to know their colleagues and the projects they're working on. 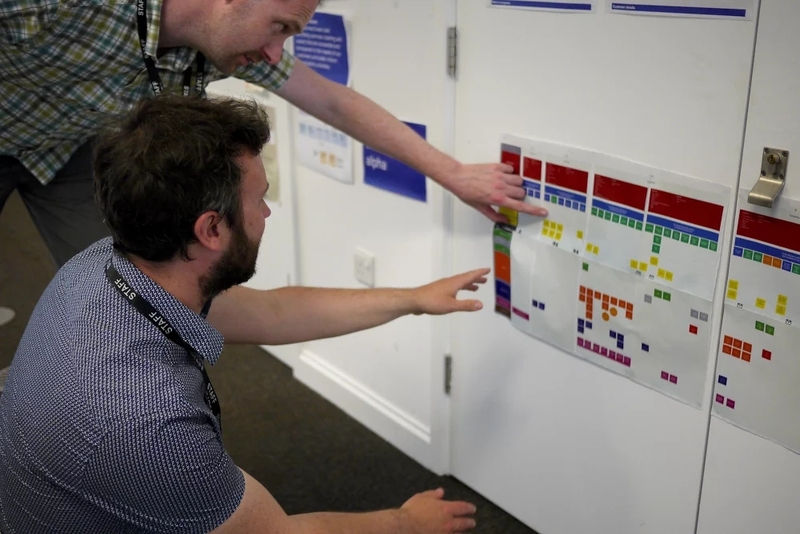 We're making our work more visible by sticking it up on our walls where everyone can see it - putting up posters, doing show-and-tells and mini guided tours in front of our agile walls, showing the thing as much as we can. This isn’t just for communicating the work to the rest of the team, it’s also for broadcasting what the work’s about to our colleagues. We're using agile tools and techniques - encouraging more colleagues to use collaboration tools (eg Trello) and adopt useful practices (eg stand-ups, regular retrospectives). Small steps towards helping the rest of the organisation embrace agile ways of working. We’re being as open as we can - we don’t want to work behind closed doors. We tell people what we do and why we are doing it, we ask for feedback and act on it. Whilst culture change is tough, especially in small steps - we are not walking this path alone. We’ve reached out to other government organisations, talking to their people, sharing with them as they share with us. We have a Digital Transformation team who are our voice across Defra - they support us, they help us make agile work and most of all, they listen to us and change what they do in response to our needs. That’s where we are starting to see change from the bottom up making a difference. We’re backed up by the growing Defra and cross-government networks (Communities of Practice and others). We have the government design principles and the Defra digital delivery principles to help guide our work. We wouldn’t be truly agile if we didn’t want to improve and there is still a lot more we could do. We want to be more open than we are. I think our show and tells could be more open and accessible for potential stakeholders and this in turn will also help spread knowledge of our agile working. Our current ways of working are not without challenges to agile teams. Team members are always coming across things they think can be made easier or better and the agile way is to be vocal about these - that’s not always straightforward in an organisation that’s undergoing as much change as Defra is right now. Geography causes problems: we'd love to find better ways to share informally with colleagues in the many Defra offices across the UK, from Truro to Newcastle. We’d like to make it easier to work with these colleagues, because their opinions are as important as anyone else's. As well as teams sharing what they've learned, we'd like to see Communities doing the same. We think there's a lot to share there. Oh and we could do more blogging. We should do more blogging. Just writing this one has been quite cathartic. Paired writing also helped, I’ll be recommending that (thanks Giles!). One more thought: sometimes cultural change like this is quite easy. Sometimes it’s quite hard. But aren’t we supposed to do the hard work to make things simple? Great post Dan and I fully agree with your sentiments - they very much apply to Continuous Improvement thinking too. Core to my thinking is there is no "Us and them" when it comes to agile or digital working. There is just "us" and we are all trying to get the best outcome we can.